Our destination: our friend’s house in Palos Verdes. But this time, our tardiness had a purpose. We’d been warned about impatient and fast-driving Malibu commuters and planned to avoid riding Hwy 1 during commute hours. That knowledge gave us license to take the morning at a slower pace and roll out after traffic died down. A week prior, in Big Sur, a guy named Doug wandered into the hiker/biker site and struck up a conversation with us. He was with his dad and his son on a three-generation family road trip. Doug was staying at the Big Sur Lodge but spent some time wandering around the campground. He wanted to know all about our trip and was impressed we were traveling with kids. He chatted with us for a while and ended up giving us his card and told us to look him up when we passed through his home town of Malibu. He told the kids he lived on the beach where we could swim, use his boogie boards, and outdoor shower! We remembered his offer as we approached Malibu and the kids asked if we would look up Doug. As we rode toward Malibu we fantasized about the big waves we’d catch, movie stars we’d glimpse, and our luxurious, Malibu beach-side shower opportunities. But realistically we’d known for a couple days a visit with Doug wasn’t going to work into the schedule − waiting out traffic meant we had to press on through LA just to make it to our friends’ house on the far side of town. Still, Doug’s kind offer to share a bit of his life with a traveling family was greatly appreciated. If you’re out there Doug, THANKS! Instead of boogie boarding and swimming at Doug’s house, we rolled into Malibu and ate fish n chips at the Fish Grill. We checked in with our friend, Matt, via text, whom we were staying with that night and gave him our best guess eta. After a quick lunch as a kosher (?!) fish taco shack , we set off toward LA. 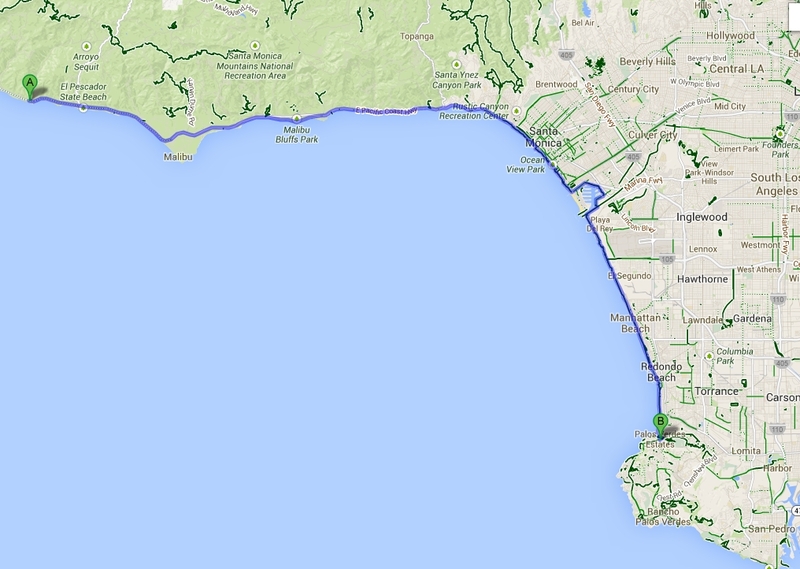 The route followed Hwy 1 through Malibu and to the outskirts of Santa Monica. At about mile 26, the route left Hwy 1 and turned onto the Strand, a 20+ mile long beach path that meanders through beach towns from Santa Monica to Redondo Beach. We were happy to leave busy Hwy 1, but quickly tired of the meandering, sandy, slow-going bike path. Our pace dwindled to a couple of miles an hour as we dodged skateboarders, tourists on beach cruisers, joggers, and drifts of sand on the twisty, traction-impaired path. As we approached Venice, we decided to get off the beach path and walk our bikes through a pedestrian area. We thought we could find some ice cream and let the kids experience the Venice vibe for a few blocks. Whoa, wheeling two tandems through that wasn’t much better than riding the Strand. After the brief break, we got back on the beach path and resumed pedaling, again at a snail’s pace! Have I mentioned Tim doesn’t like the beach? He likes secluded peaceful wilderness beaches, where you can relax in solace. But he’s not at all a fan of crowded, noisy, sandy urban beaches and his nerves frayed with each mile traveled. As the slow, sandy beach riding continued, Tim’s patience thinned. He might have lost his temper at one point and asked yelled at his stoker to get off the bike so they could walk. We were riding at a walking pace anyway, so why not? Tim’s knees were still sore and the slow beach riding was making the pain worse. When traveling with a family, and especially a family of four on two bikes, sometimes we lose our patience and our cool (note from Tim: Guilty as charged). We don’t claim to be perfect and we’d all had bad days throughout the trip. I was that grumpy lady in Big Sur. When someone is mad, it’s best to just leave them alone. So we let Tim vent, and he eventually got over it and started pedaling again. The route continued along the beach path and at one point even went through a parking garage. We continued to pedal, anxious to reach our destination and looking forward to catching up with old friends. Matt had texted a few times throughout the afternoon, giving us directions (your last three miles are all uphill. Sorry about that), and checking in on our ETA. Luckily Tim likes climbing hills much more than that he likes beach riding. We thought Matt just wanted to coordinate the dinner schedule but instead he had a surprise planned. As we crested the climb at a lovely ocean viewpoint in Palos Verdes, Matt was waiting with his camera while his family met us with cheers! What a nice treat. I might have choked up a bit — after all we’d been through, it warmed my heart to see old friends and have them come meet us to celebrate our accomplishment. We pedaled the last couple of miles to Matt’s house, rolled our bikes into the yard and settled in for the night. Even though they were in the middle of packing for a move, Matt and Bridget invited us to stay (inside! No tents! and showers with real plush towels!) and made us feel welcome in their home. We enjoyed a break from the road with old friends: catching up, delicious food, and a glass or two of wine around a patio fire-pit. High: Arriving at our friend’s Matt and Bridget and being greeted with cheers and congratulations! Low: We learned that Tim really, really really doesn’t like beach towns and beach path riding! This entry was posted in bikes, Pacific Coast Bike Tour and tagged 2013, acapaccoast, beach, beach riding, bike tour, bike touring, bikes, CA, carfreedays, family bike touring, Family Cycling, kids, LA, Pacific Coast Bike Tour, tandem, tandem bike tour, two tandem bike tour. Bookmark the permalink. You guys rock! The parking garage bike path is interesting…. I spent my fourth grade year living in Palos Verdes. Haven’t thought about that place in a long time…..
A bike tourist we met in Big Sur, who was traveling north and had ridden through LA a few weeks prior, warned us about the parking lot bike path. Really strange! Our assessment after 15 hours in Palos Verdes — it was beautiful. I could live there, if I didn’t have to go anywhere else and could just stay there : ) Seems like it would be a pleasant place to pass your fourth grade year…. only in Cali parking lot bike path!